Over at the Crafting King’s blog (Tim Holtz) this moth is ‘Enjoy the Journey’. I started with a tag then used acrylic paint and painted different pinks and purples onto it. I then spritzed with water and then got a piece of cling film, scrunched it up and applied to the top of the tag. I then took it off and it created a soft lines look all over the tag giving it an antique feel. 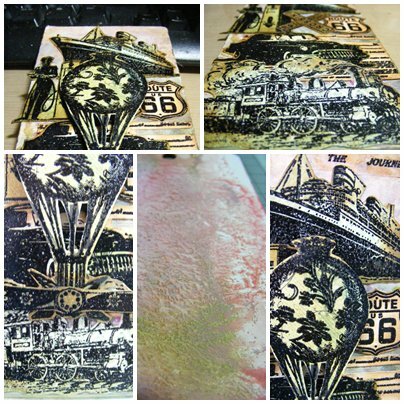 I then took the Stampers Anonymous Travel Ways and Inkadinkado Steam Punk stamps and stamped some of them out onto patterned papers with Versamark and heat set with WOW ebony embossing powder. I then cut them all out and went around the edges with Gathered Twigg distress ink. The background ones I stamped with archival ink onto the tag and painted over with glue and seal which means that I can ink over the image to the background then buff the ink off the image and it wont stick to it. I then printed out onto acetate the works ‘Enjoy the Journey‘ and cut them out. I stuck these words onto the tag with Cosmic Shimmer Acrylic Glue which dries clear. I then put the tag together. ← Tempus Fugit – Time Flies…. What fantabulous images – great take on the tag!